a skeleton on a rocking horse. clowns behind the skeleton. 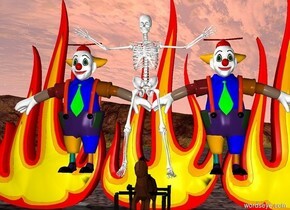 There are 5 10 feet tall fires on the ground behind the clowns. There's a large skeleton. The ground and sky are fire. 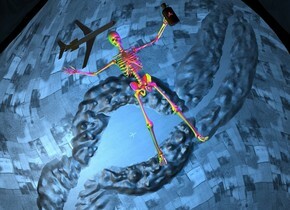 The skeleton is facing south. The skeleton is on top of a dinosaur. The dinosaur is red. There's a very large cat on top of the skeleton. There's a small guy on top of the cat. There's a large hat on top of the guy. 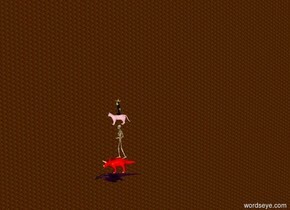 The cat is pink. The dinosaur is on top of a dragon.The dragon is purple. The huge laptop is on the large desk. 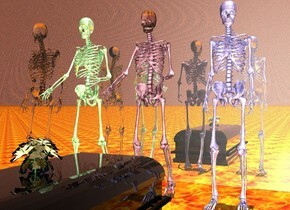 The tall skeleton is standing behind the desk. 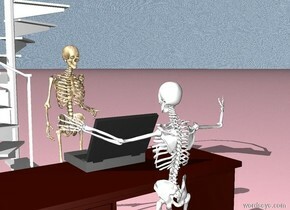 The laptop is facing the skeleton. 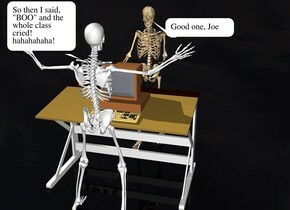 The desk is facing the skeleton. The sky is water. The ground is pink. The stair is 5 feet behind the skeleton. The stair is 20 feet tall. The bottle is on the stair. The bottle is green. The bottle is 3 feet tall. 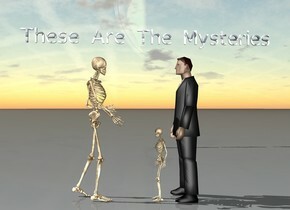 There is another skeleton. The skeleton is in front of the desk. 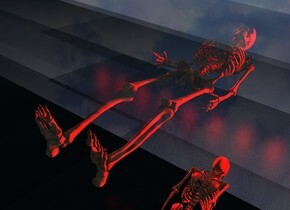 The skeleton is facing the desk. The skeleton is 10 feet tall. there is a child. the child is 2 feet above the ground. the ground is lava. there is a volcano. 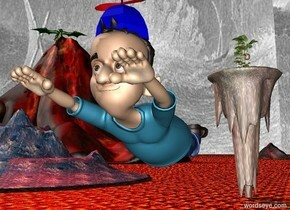 the volcano is 45 feet behind and 24 feet to the left of the child. the volcano is on the ground. there is a hat. there is an apple. the apple is 2 feet in the child. the hat is 5 inches in front of the apple. the hat is 15 inches above the apple. the sky is sea. there is a dragon. the dragon is above the volcano. there is a huge rock. the rock is on the ground. the rock is 5 feet behind the volcano. the rock is 10 feet to the right of the volcano. there is a tiny stone mountain. the mountain is on the ground. the mountain is behind the child. the mountain is 3 feet to the left of the child. the ground is unreflective. the mountain is facing the dragon. the hat is 4 inches in front of the apple. there is a melon. the melon is four feet above the apple. the melon is twelve feet behind the apple. the hat is facing the melon. there is an upside down microscopic tall rock hill. the hill is below the melon. the dragon is facing the melon. there is a red light twenty feet above the volcano. there is a skeleton on the dragon. .
Coffee is on top of the 2nd coffee. 3rd coffee is next to the 2nd coffee. coffee is on the left of the 4th coffee. 2nd coffee is on the right of the 4th coffee. 3rd coffee is under the 4th coffee. the ground is texture. 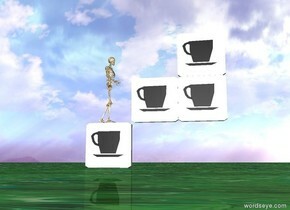 there is a small skeleton on the 3rd coffee. the skeleton is facing east. The 300 foot tall red skeleton is on the ground. 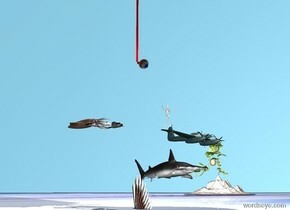 The 200 foot long red "Libito" is above the skeleton. 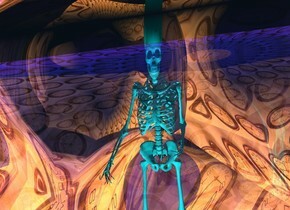 The 200 foot tall blue brain is 100 feet in front of the skeleton. The brain is facing the skeleton. 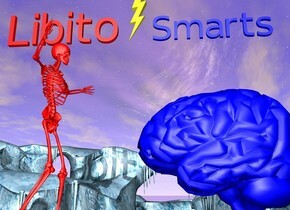 The 200 foot long blue "Smarts" is 100 feet above the brain. The "Smarts" is facing the left. The "Libito" is facing the left. The 100 foot long yellow lightning bolt is 5 feet behind "Smarts". The lightning bolt faces the left. 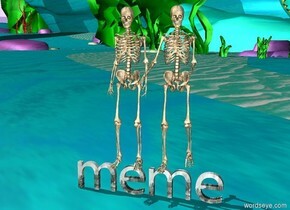 two skeletons on a green bridge "meme"
A reflective purple car is facing southeast. A reflective purple table is 2 feet south of the car. 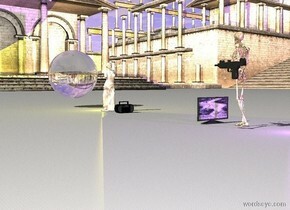 A shiny pastel pink skull facing southeast is on the table. A big white transparent gargoyle facing southeast is 1 meters west of the car. An enormous shiny transparent wall is north of the car. A 2nd enormous shiny blue wall is 50 feet south of the wall. The camera light is pastel pink. The ground is shiny purple. 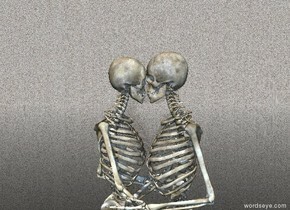 The first skeleton is facing the second skeleton. 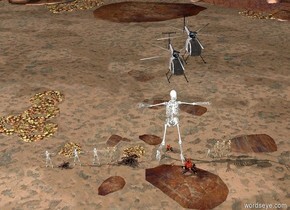 The second skeleton is facing the first skeleton. The first skeleton is -1.55 feet to the front of the second skeleton. The ground is transparent. The sky is glass. The first wall to the right of the first skeleton. The first wall is facing right. The first wall is transparent. The camera-light is cornflower blue. there is a clear skeleton. its tooth is red. 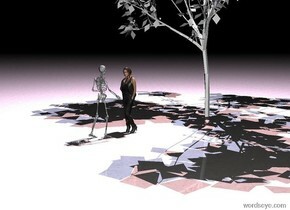 there is a 6.1 feet tall silver skeleton -27 inches behind it. 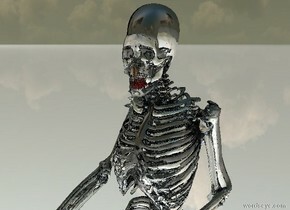 there is a 6.2 feet tall shiny black skeleton -28 inches behind the silver skeleton. the ground is shiny.